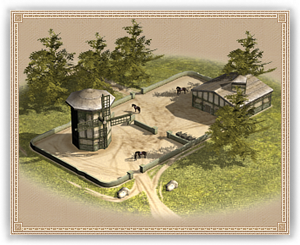 Any castle looking to garrison cavalry units naturally needs a place to house the mounts, and that invariably means building a Stable. The entry-level stable is truly little more than an imposing wooden shack, designed to house up a group of horses so as to shelter them from both the weather and poachers. Producing truly well trained cavalry will require much more development.